Target recently added Champneys Bath & Body products to their store and online offerings, which is a luxurious line created by Champneys Day Spas in Great Britain. Today I have a review of their Mediterranean Bliss Shimmering Body Oil, and another little Birthday Month Giveaway of this product for one lucky follower! NEW YORK — Champneys, a spa established in 1925, now has brought its 90-year heritage in health and beauty stateside with the introduction of a line of bath and body products at Target in March. The collections within the Spa Indulgence and Spa Treatments were developed to help deliver the holistic benefits of visiting a Champneys Spa. “The quality of the Champneys Spa collection is unmistakable; each and every product reflects the remarkable expertise of our therapists. With our massage therapists so intricately involved in the development of the collection, we’ve been able to create bath and body products that truly deliver the luxury spa experience to the mass market,” stated Jo Parker, Champneys Group Spa director. The Spa Indulgence collection is comprised of three collections: Oriental Opulence, Mediterranean Bliss and Exotic Retreat. The Spa Treatments collection is used by the therapists at Champneys Spas. They boast restorative properties and include a variety of fragrances, as well as a range of hand and foot products. Here's a look at the product before massaging it into my skin. This moisturizing dry oil looks blingy and glittery in the bottle, but once applied, it adds very subtle sparkle and sheen to the skin for natural looking radiance. There is no oily residue left after it's applied and absorbed, and the shimmer is smooth and well dispersed. I've used similar products that leave obvious glitter on your skin, but this one is nicely done and simply adds a touch of elegance with it's micro gold flakes. As you can see in my photo above, the formula is a copper/gold colored oil of medium consistency. I simply shake the bottle well, pour it into my hands, and then massage it into my skin. It can be applied directly after showering, or applied over your moisturizer for added hydration. It leaves my skin glistening and soft, and it's subtle enough that you can use it every day, not just on evenings out when you want to enhance your skin. 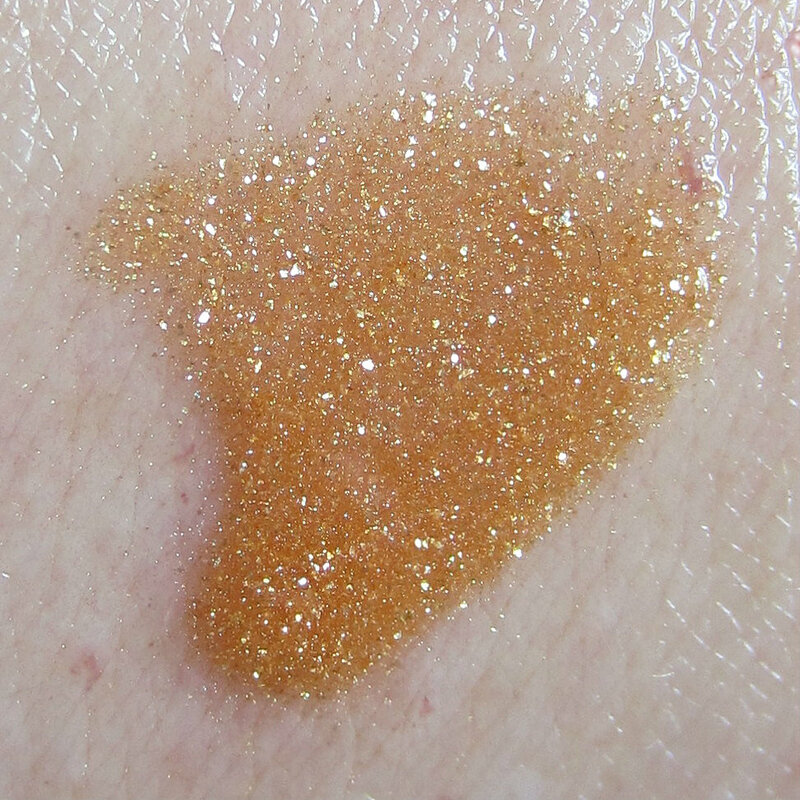 You can use this to highlight certain areas like your collarbone or your legs, or you can use it all over. When I read the ingredients, I was afraid that the scent may be too strong and musky, but it's not at all. It's warm and soft, with a gentle scent that doesn't overwhelm the senses or clash with any other fragrance you may choose to wear. It's filled with nourishing and moisturizing ingredients to benefit your skin, and you can read more about those below. An opulent fragrance with a white floral heart of Tuberose, Jasmine, Lily Of The Valley and White Rose Petals with spicy exotic Ylang Ylang and Petunia on a warm combination of Sugar Cane, Vanilla, fresh Ginger and Pink Pepper. Fruity twists of Cassis and Apple entwined with a Mediterranean citrus accord of Bergamot, Mandarin and Neroli Oil create a vibrant top note while precious Woods, Patchouli, Sandalwood and Vetiver add richness to a base of Amber, Moss and Musk. Rice Bran Oil - Renowned for its skin moisturizing properties. A skin conditioning agent that leaves skin feeling moisturized, soft and with a silky smooth feel. Sesame Seed Oil - Great moisturizing and nourishing properties. The oil is also used for detoxifying the skin. Jojoba Oil - A rich velvety oil that creates a non-occlusive layer that provides exceptional moisture and supports the skin’s barrier to give enhanced flexibility and suppleness. How to Enter: If you'd like to enter for a chance to win your own bottle of Champneys Mediterranean Bliss Shimmering Body Oil, just leave your eMail in the comments section below. If you have any similar products that you use to accent your skin during the warmer months, let me know what they are. I sometimes sprinkle loose eye shadow pigments into bottles of lotion using golds and coppers for a little added shimmer during the summer months. I also use Michael Kors Leg Shine along the front of my legs, but that scent is one that can overpower a bit, so I be sure to use unscented lotion when using that! If you're not comfortable leaving your eMail address, please check back on Saturday, June 9, when I'll announce the winner. Entries will be accepted until midnight, June 8. It sounds interesting - I've never used such a product, but because it's so dry here I use body lotions all year round, and it might be nice to get a little extra bonus of shimmer! tropicalchrome .at. gmail (dot) com. I have been using the MAC Bronze Body Oil. I've never tried anything like this, but anything to help hide my pasty legs in the summer sounds great! Sounds fun! My name is Angie, and my email is as follows: Angelad(dot)fischer(at)yahoo(dot)com. Thank you! I love shimmer lotions, I have one from Bath and Body Works, SunFx, and Lorac. Plus I like to dust MAC's pigment in Melon with a huge body brush. I always use oil as a moisturizer - it is just so luxurious! However, I usually stay away from "shimmer" products because of the obvious glitter that you mentioned, so this sounds really intriguing! I never really thought about the mixing eyeshadow in lotion idea, but I am totally going to try it now! I usually just use a little bronzer on my chest. I don't normally use shimmer things on my body but why not start? This would be lovely on summer legs and arms especially. The only one that I have used before is Body Shop Spiced Vanilla Shimmer Lotion and I really liked it especially because I think it's the best scent ever! Awesome !!! I would love to win this! I love the urban decay body powders especially the marshmallow one, they look really pretty! This looks like a cool product! i use johnson's baby oil for a sheen on my legs. i would love to try this! Love shimmer lotions but they seem to be getting a little hard to find. Would love to try this one! I've never used a product like this before but it looks like something that I would love to try. i use an aveda oil, but the shimmer in this would be nice for summer! need to find in the us for sure! I've never used anything like this, but I'd love to try it!